Back in August, I decided it was high time I slipped some thrills back into my life. Things were feeling dull and repetitive. I just couldn't get excited about each new day. Without hesitation, I started a list of things I've always wanted to do, but have kept pushing to the back burner. It's amazing what power the simple act of writing something down for all to see can have. Within weeks, I found myself behind a tow plane being lifted into the sky near Winston Salem, about to be released to experience my first glider ride. If you have never been soaring, you cannot imagine the heart pounding exhilaration. What a sensation! September has been a quiet month spent pressing my nose to the grindstone, doing my best to make a few bucks, a percentage of which I now stash into my wish jar. There were a couple possibilities on my list bubbling for October. I wanted to be ready just in case. You never know what will fall into your lap once you've set the wheels into motion. Sure enough, I have somehow convinced my brother to go on an excursion with me. We haven't done anything together since the sixties besides meet at family gatherings, weddings, birthdays and funerals. It is high time we got reacquainted with each other. What better way to connect the old bonds than to spend four days and nights together, sharing a tiny cabin and first winds of autumn on the deck of a sail boat. That's right! My brother and I are going to be guest crew aboard the Liberty Clipper, as she begins her trip south for the winter with a schooner race in the Chesapeake Bay. I've always wanted to sail aboard one of the tall ship, and we'll be among fifty or so ships making their way from Baltimore, Maryland to Portsmouth, Virginia. I feel sure there will be stories to tell. And from what they tell me, a wonderful blue crab dinner the first night, served up with many new friendships. 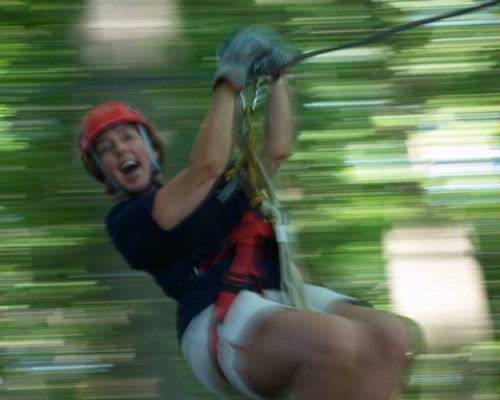 As if that weren't enough for one month, a dear friend of mine notice zip-lining on my Bucket List. One thing has lead to another, and come the end of October, we three old amigos will be zipping through the fall canopy near Hanging Rock, North Carolina. You can just imagine the whoooo hooooos, laughs and giggles echoing through the forest as we take our first plunge. What a hoot it will be. I expect the picnic lunch we share afterwards, and many lunches in the future, will be just as much fun for the memories. At a certain point in your life, you finally appreciate that you have worked hard and have paid your dues. There is no point in waiting any longer to do the things there was no time or money for in your younger years. Realizing there are fewer days ahead than there are behind, is to understand the value of each. You have earned your rewards, and now it is time to indulge yourself. Make that list, set aside your fun money, and get on with your dreams. Do it while there's still time to tell the tale!